Vapor intrusion (VI) is the general term for the migration of volatile organic chemicals (VOCs) through soil and into buildings. The aerobic biodegradability of petroleum hydrocarbons typically reduces the potential for petroleum vapor intrusion (PVI) and justifies a different approach for addressing PVI than for vapor intrusion from chlorinated solvents and other non-aerobically biodegradable volatile organic compounds (VOCs). Provided that the sources of petroleum hydrocarbon vapors and potential receptors are separated by an adequate distance, called the separation distance, PVI generally does not pose a concern, and a VI investigation is not warranted. Based on information obtained during site characterization and development of a conceptual site model (CSM), a lateral inclusion zone is delineated, and then vertical separation distances are determined for all buildings within this zone. For buildings where the vertical separation distance meets established screening criteria, further investigation is generally not required. However, for buildings where the vertical separation distance does not meet screening criteria, or other precluding factors are present, additional assessment of the potential for PVI is necessary. Vapor intrusion is the general term given to migration of volatile organic chemicals (VOCs) from any subsurface contaminant source, such as contaminated soil or groundwater, through the soil and into an overlying building (Fig. 1). 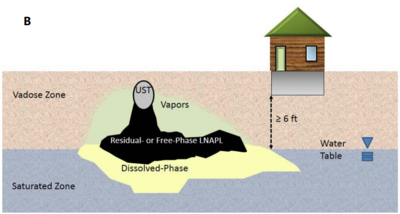 Figure 1 Typical conceptual models for vapor intrusion from a release of petroleum hydrocarbons (such as a fuel spill) and for a release of chlorinated volatile organic compounds. Petroleum hydrocarbons generally biodegrade rapidly under aerobic conditions, common in unsaturated soil. As a result, aerobic biodegradation typically reduces the potential for vapor intrusion by petroleum hydrocarbons. In contrast, the vapors of common chlorinated solvents such as tetrachloroethene (also known as perchloroethylene or PCE), trichloroethene (TCE) and 1,1,1-trichloroethane (1,1,1-TCA) do not readily degrade in the unsaturated zone. As a result, the potential for vapor intrusion by chlorinated volatile organic compounds is much greater (Fig. 1). 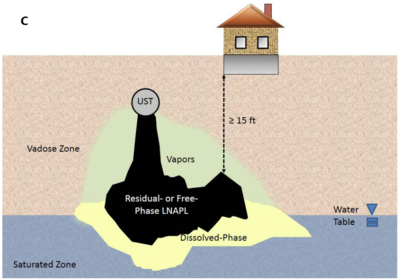 In the USA, addressing the potential for petroleum vapor intrusion is an integral part of the normal response to a suspected or confirmed release from any underground storage tank (UST) system that is regulated under Subtitle I of the Resource Conservation and Recovery Act. The U.S. Environmental Protection Agency (EPA) recommends that degradable petroleum hydrocarbons from fuel spills from leaking underground storage tanks (USTs) be managed in accordance with the Technical Guide for Addressing Petroleum Vapor Intrusion at Leaking Underground Storage Tank Sites (USEPA PVI guidance). The potential for VI concerns from non-degradable petroleum hydrocarbons should be assessed following the more general guidance, OSWER Technical Guide for Assessing and Mitigating the Vapor Intrusion Pathway from Subsurface Vapor Sources to Indoor Air. The USEPA PVI guidance explains how to define lateral inclusion zones, which typically are determined site-specifically, and provides vertical separation distances for evaluating non-aqueous phase and dissolved phase petroleum hydrocarbon sources (Fig. 2). Figure 2, Panel A: Lateral separation distance from petroleum contamination. Figure 2, Panel B: Vertical separation distance from aqueous phase petroleum contamination. 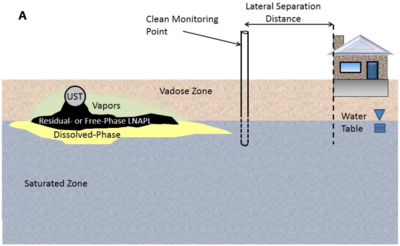 Figure 2, Panel C: Vertical separation distance from LNAPL petroleum contamination. As described in the USEPA PVI guidance (2015a), the spatial relationship in both the vertical and horizontal directions between the contamination and a building partly determine the potential for vapor intrusion. In general, buildings may be excluded from further assessment for vapor intrusion if they are sufficiently laterally removed from the zone of petroleum hydrocarbon contamination (referred to as the lateral inclusion zone). If the contamination is restricted to petroleum hydrocarbons dissolved in groundwater, a building within the lateral inclusion zone may be excluded from further assessment if there is 6 feet of clean, biologically active soil between the water table and the lowest point of the overlying building. If the contamination is present as LNAPL, a building can be excluded from further assessment if there is 15 feet of clean, biologically active soil between the highest interval containing LNAPL and the lowest point of the overlying building. If a building does not lie within the inclusion zone (Fig. 2, Panel A), further vapor intrusion evaluation for the building is not needed. See "An Approach for Developing Site-Specific Lateral and Vertical Inclusion Zones within which Structures Should be Evaluated for Petroleum Vapor Intrusion due to Releases of Motor Fuel from Underground Storage Tanks" (USEPA 2012b) for one approach to determine if a building lies in the inclusion zone based on the foot-print of the building and the distribution of monitoring wells. A building that lies above petroleum hydrocarbons dissolved in groundwater or petroleum hydrocarbons present as a light non-aqueous phase liquid (LNAPL), as shown in Figure 2, Panels B and C, is considered to be in the lateral inclusion zone of the release of petroleum hydrocarbons. Even if a building lies in the inclusion zone, however, the risk of petroleum vapor intrusion may be negligible if the vertical separation distance is adequate. When the vertical separation distance from contaminated groundwater is ≥ 6 feet (Fig. 2, Panel B), or when the vertical separation distance from residual hydrocarbons is ≥ 15 feet (Fig. 2, Panel C), it is not necessary to further evaluate vapor intrusion. These distances were derived from evaluation of field data as described below. The use of vertical separation distances to screen buildings can reduce the overall cost of site assessment and facilitate decision making. Site characterization and development of a conceptual site model provides information about the full extent and location of the contamination; the nature and characteristics of the contamination; the characteristics of the site that influence contaminant migration, including the potential for biodegradation of petroleum hydrocarbons; and the locations of receptors. Information derived from the conceptual site model helps ensure that sources, pathways, and receptors throughout the site are considered. This knowledge facilitates selection of the most appropriate sampling locations and techniques. A systematic soil gas sampling program may also aid in defining the full extent and location of contamination, determining seasonal and longer-term variation of water table elevation, detecting the presence of preferential transport pathways, and potentially locating pockets of petroleum hydrocarbon vapors. In such instances, additional investigation may be warranted to more accurately evaluate the risk from vapor intrusion. The vertical separation distance is the thickness of clean, biologically active soil between a contaminant mass and the lowest point of an overlying receptor (e.g., basement, slab, or crawl space surface). Consolidated rock is not soil and should not be included in the vertical separation distance. For example, for a situation in which there is 3 feet of soil above fractured rock and the depth to contaminated groundwater is 7 feet, the vertical separation distance is 3 feet, not 7 feet. The USEPA (2013) "Evaluation of Empirical Data and Modeling Studies to Support Soil Vapor Intrusion Screening Criteria for Petroleum Hydrocarbon Compounds" presents a compilation and analysis of soil gas data from a large number of sites that represent many different hydrogeologic settings where gasoline was released from USTs. This analysis builds on the work of Davis (2009). In addition, USEPA (2013) evaluation summarizes the results of a number of parallel efforts (e.g. Lahvis et al. (2013)). Although these studies used somewhat different data sets, there is a high degree of consistency among them. This consistency supports the establishment of vertical screening distances based on whether contamination is present as LNAPL or dissolved petroleum hydrocarbons; that is, the thickness required to aerobically biodegrade petroleum hydrocarbons is directly related to the strength of the source. For dissolved petroleum hydrocarbon sources that are separated from overlying buildings by more than 6 feet of clean, biologically active soil, the potential threat of vapor intrusion is negligible, and further investigation for vapor intrusion is generally unnecessary. For LNAPL sources that are separated from overlying buildings by more than 15 feet of clean, biologically active soil, the potential threat of vapor intrusion is negligible, and further investigation for vapor intrusion is generally unnecessary. These separation distances are believed to be sufficiently protective in most situations because they include a number of built-in safety factors. Exceptionally dry (<2 percent soil moisture) or moist soils (as from precipitation). Concern about the presence of ethylene dibromide (EDB) and 1,2-dichloroethane (1,2-DCA), which were used as lead scavengers in leaded gasoline. After the USEPA (2013) evaluation was published there has been additional work on aliphatic compounds and EDB and 1,2-DCA. Lahvis (2018) publication evaluated empirical field data on the vertical distribution of C5 - C8 aliphatic hydrocarbons, C9 - C12 aliphatic hydrocarbons, and n-hexane and found that results generally support the 15-ft screening distance for LNAPL sources at petroleum UST sites. The Ma et al. (2016) article used computer simulations to evaluate whether vapor intrusion by EDB and 1,2-DCA was a concern. Their simulations suggest that concentrations of EDB and 1,2-DCA may exceed the USEPA screening level in indoor air when the concentrations of EDB and 1,2-DCA at the source are high and there is no aerobic or anaerobic biodegradation of EDB or 1,2-DCA in soil gas. Because soil gas movement may vary seasonally in response to differential pressures created by heating and cooling of overlying buildings, and the depth to the water table may also vary seasonally, the site characterization should include evaluation during different seasons. Where vertical separation distances are less than those specified in the USEPA PVI guidance (2015) but contamination is not in direct contact with an overlying building, EPA recommends one of two options to assess attenuation of petroleum hydrocarbon vapors: (1) collection of shallow near-slab soil gas samples paired with deep near-source soil gas samples, or (2) collection of indoor air samples paired with sub-slab soil gas samples. If the potential for vapor intrusion cannot be ruled out based on the vapor attenuation observed using option 1, then EPA recommends using option 2. If preferential transport pathways connect the vapor source and a building, then EPA recommends indoor air sampling paired with sub-slab soil gas sampling as appropriate. If contamination (either dissolved or LNAPL) is in direct contact with a building EPA recommends indoor air sampling. If the potential for vapor intrusion still cannot be ruled out based on the results of the appropriate sampling, then mitigation is recommended. In the USA, suspected or confirmed releases from underground storage tank (UST) systems are regulated under Subtitle I of the Resource Conservation and Recovery Act. The potential for vapor intrusion by petroleum hydrocarbons at these sites should be evaluated following recommendations provided in the USEPA PVI guidance. Unless there are precluding factors at a site, buildings may be excluded from further assessment for vapor intrusion if they do not lie above petroleum hydrocarbon contamination (within the lateral inclusion zone). If the contamination is restricted to petroleum hydrocarbons dissolved in groundwater, a building in the lateral inclusion zone can be excluded from further assessment if there is at least 6 feet of clean, biologically active soil between the water table and the lowest point of the overlying building. If the contamination is present as LNAPL, a building can be excluded from further assessment if there is 15 feet of clean, biologically active soil between the highest interval containing LNAPL and the lowest point of the overlying building. This page was last edited on 5 April 2019, at 20:09.